Just over a week after the killing of five police officers during a rally in Dallas, experts say Black Lives Matter is at a critical point in its history. Four years after its founding, the grassroots movement remains polarizing. Politicians, celebrities, and other newsmakers have passionately weighed in both in support of and against the group — or at least its rallying cry — and it has also generated sometimes sensational headlines in the media. Founded as a hashtag by three citizens following the acquittal of George Zimmerman for the 2012 shooting death of 17-year-old African-American Trayvon Martin, Black Lives Matter is very much a grassroots organization. Shanelle Matthews, the San Francisco-based director of communications for Black Lives Matter, was unavailable for comment before press time, but earlier this year she told PRWeek that its more than 30 chapters work mostly autonomously with the goal of rebuilding "the black liberation movement and [to] affirm the lives of all black people." In particular, the organization has focused on advocating for "those marginalized within black liberation movements." 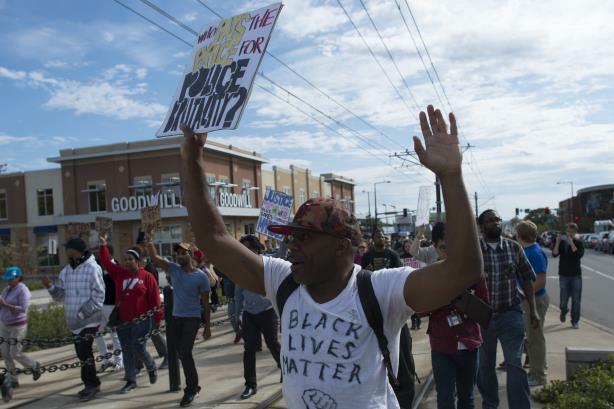 A just-released poll from the Pew Research Center, conducted from February 29 to May 8, shows diverging attitudes, awareness, and understanding of Black Lives Matter. Roughly four in 10 Americans back the movement, with support highest among blacks (65%, versus 40% for whites); Democrats (64%, against 20% for Republicans); and adults younger than 30 (at about six in 10). More than a third (36%) of people familiar with Black Lives Matter say they don’t understand the organization’s goals. Another 30% had either not heard of it or nor did they have an opinion. Has Black Lives Matter lost control of the message? On social media, critics of the group have responded with the hashtag "#AllLivesMatter," believing the term "Black Lives Matter" devalues other races. Meanwhile, some newsmakers, from presidential candidate Donald Trump to conservative radio host Glenn Beck, have argued that the name of the movement is divisive. Others believe the movement will fail to gather support resulting in serious reform. However, the communications experts interviewed by PRWeek reject that assertion, saying any challenge the organization has in gaining widespread public support stems from other issues, including its decentralized structure. They also say mainstream media coverage has been biased against it, sensational, or knee-jerk. Kim Hunter, president and CEO of Lagrant Communications, says Black Lives Matter is well intended, noting "that as an African-American male, believe me, I understand the rationale for the creation of the organization. I have been harassed and pulled over by police without reason, and I have no illusion that it was because of the color of my skin." However, he says the group’s honorable intentions have not been well-communicated to the general public. As a result, there is confusion, disruption and misrepresentation of what Black Lives Matter actually stands for among newsmakers and the media, he contends. "I think the fact that it is a grassroots organization is a good thing, but they can be more systematic, procedural, and defined in their approach," says Hunter. "Many of their spokespeople are inconsistent with their messaging. If they are truly going to have an impact, they need to be better formalized in what they want to achieve." He adds that the organization should align with allies and credible spokespeople who could help it gain better leverage in the media and help with clarity of message. "They need sophisticated groups and individual stakeholders who are passionate about what Black Lives Matter wants to achieve and who are part of the organization," he explains. "But I don't know a single person who is a part of it right now." Fay Ferguson, co-CEO of trans-cultural communications firm Burrell, agrees that for Black Lives Matter to advance its goals for reform, it should build one unified organization to oversee messaging. She calls centralization crucial, given the dissenting views. "I understand the need for local chapters, so that people can get into the streets because that’s where things happen. But I think they also need a unified structure around the organization to help control content and messaging, because anyone can put their spin on it right now," notes Ferguson. She notes that it should step up sit-down meetings with police departments nationwide. "That to me is the missing piece," Ferguson says. "They need to take the movement from protesting to conversation and making real change." Still, she applauds the "excellent job" Black Lives Matter has done to bring the issue of injustice against black Americans to the forefront, which is what it set out to do. "They have been very good at activating youth of all cultures and backgrounds, which I think is important because this isn’t a black problem; it really is an American problem," says Ferguson. "They’ve also been really good at using social media; their Twitter handle is always active with posts and responses." Neil Foote, president of the National Black Public Relations Society, says the biggest challenge the movement faces is biased and sensational media coverage. News articles often connect the Black Lives Matter movement to people who have used violence, even if there is no affiliation. "There have been some negative things that have been assigned to the Black Lives Matter brand, which they will just have to overcome," says Foote, who also owns the firm Foote Communications. "They have to keep communicating that they are a nonviolent group and that they are working for change. The next thing for them will be to communicate what those specific changes should be." While the NBPRS does not have a formal relationship with Black Lives Matter, it has discussed various issues with chapters around the country. The organization also plans to address how African-Americans are portrayed in the media at its national conference in Chicago at the end of October. "Clearly, the bigger issue that Black Lives Matter gets at is how African-Americans are portrayed in the media, which is to say in a negative and perpetuating way," says Foote. Zandra Zuno Baermann, executive director and multicultural marketing practice lead at Golin, agrees that the mainstream media has done Black Lives Matter no favors. She argues that, generally speaking, the press does a poor job addressing issues facing people of color. "This is a reflection, to a certain point, on the lack of diversity that exists in newsrooms and the limited understanding of not only the issues, but also the context and historical background," says Zuno Baermann. "What we see covered in mainstream media are moments-in-time versus the overall Black Lives Matter movement. The coverage is still very much on the surface with a tendency for media to shift coverage to what is breaking news, versus really taking that deeper dive."